Southeast corner of One Manhattan West from 9th Avenue. 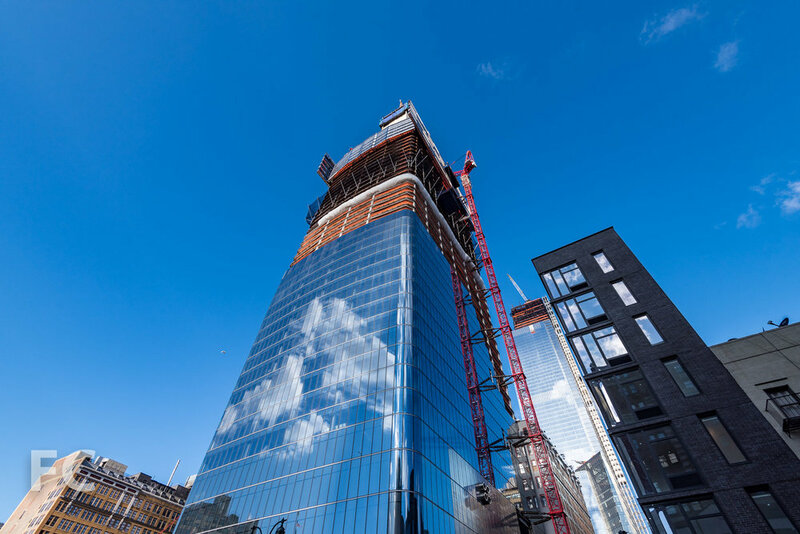 Construction continues at Brookfield Properties' Manhattan West, the six building mixed use mega-development adjacent to the new Hudson Yards neighborhood. The latest component of the project to begin construction, One Manhattan West, continues to rise. Designed by Skidmore, Owings and Merrill (SOM), the 67-story tower will offer 2.1 million square feet of office space when it opens in 2019. Curtain wall installation continues on the lower third of the office tower, while steel superstructure has surpassed the half-way mark. A slightly smaller 62-story office tower at Two Manhattan West, also designed by SOM, will follow in 2021 on an adjacent site to the south. Looking up at the east facade of One Manhattan West (right) and The Eugene at 401 West 31st Street (left). Looking up at the northeast corner of One Manhattan West. Looking west towards One Manhattan West (center). Close-up of the James A. Farley Post Office building (foreground) and One Manhattan West (background). Architects: REX (Five Manhattan West), SLCE (401 West 31st Street [Architect of Record], SOM (401 West 31st Street [Design Architect], 1 Manhattan West, Master Plan Architect); Landscape Architects: James Corner Field Operations; Developer: Brookfield; Program: Office, Residential, Retail; Location: Hudson Yards District, New York, NY; Completion: 2017 (Five Manhattan West, 401 West 31st Street); 2020 (One and Two Manhattan West).